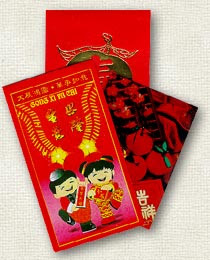 It’s a Chinese custom to give out angpao money to young children, or elderly during Chinese New Year. My kids love the angpaos, especially since there is money in it! Normally, I will take out the money and let the kids keep the red packets for fun. I’ll get hubby to bank in the money back home, in my boy’s account, when he’s going back this weekend. We let the kids share one account so far, and haven’t got one for my gal. I know it sounds unfair, but we will get this done in the future. If I manage to get a work permit here, after taking over hubby’s company, I will try to get an account for her in Bangkok. So far, I can’t get my own account here either. I guess we will bank in the equal amount of money into her account, just like her brother’s. By doing so every year, the kids might have quite a lot of money by the time they are 18 years old. Then, they can decide on what they want to do with the money. Hopefully, my boy won’t spend all on Ferarri Part and my gal won’t spend all on design brands.